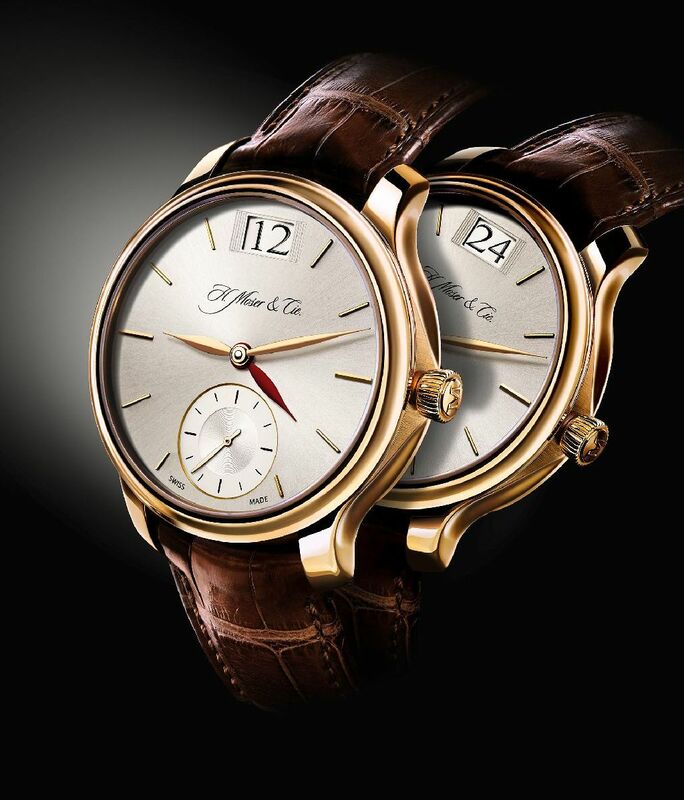 This year, Swiss luxury watch brand H. Moser & Cie unveiled its first automatic movement at Basel world. This new movement, exclusive to the Meridian – Dual Time combines well-known and popular complications with a special new feature: an AM/PM display, which changes automatically from 12 to 24 hours. The prominent window at the top of the dial displays a 12 in the morning (AM) and a 24 in the afternoon (PM) for the home time zone. The somewhat smaller red hour hand for the second time zone can be adjusted forwards or backwards in steps of one hour by means of the crown. Thanks to Moser’s patented Double Pull Crown system, the central position of the crown can be easily located without the watch being inadvertently stopped or the home time being adjusted. If the second time zone is not required, the different-coloured hour hand is hidden under the normal hour hand and thus moves along with it unseen. With a power reserve of 72 hours, i.e. three full days, the Moser automatic movement HMC 346.121 is one of the longest-running models available. The large, solid gold rotor bears the engraved company seal, a symbol of the quality and authenticity of every Moser watch for 185 years. The rotor transfers its energy to the large barrel by means of a pawl winding system which is wound up in either direction. One of the two pawls turns the pawl wheel on pull, the other on push. The accuracy of the Meridian – Dual Time is assured by Moser’s characteristic interchangeable escapement module which, naturally, also features a Straumann Hairspring, produced in-house, a Breguet overcoil and a pallet fork and escapement wheel in hardened solid gold. 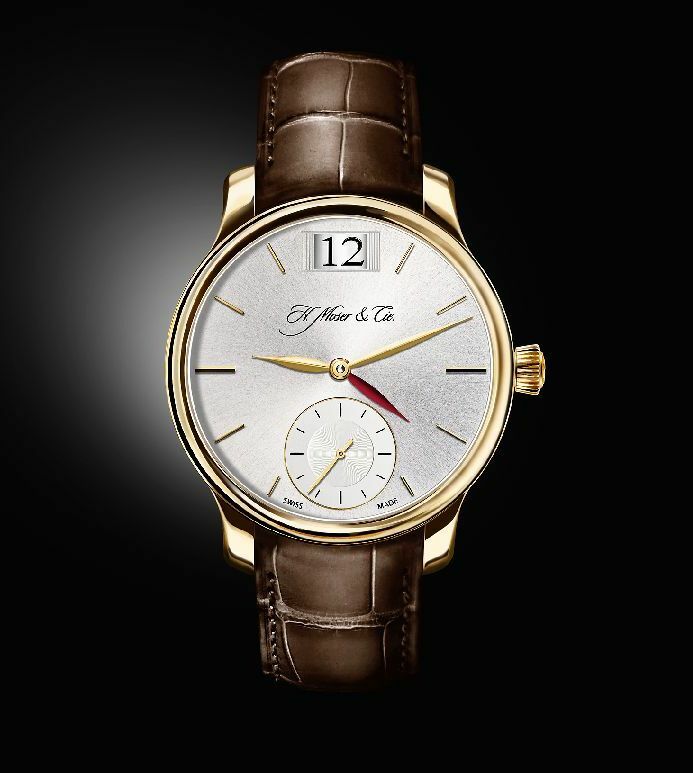 The Meridian – Dual Time also has Moser’s characteristic freely formed lateral surfaces on the case flanks. The see-through sapphire glass back of the watch allows the observer a closer look at the new mechanical automatic movement developed by Moser. 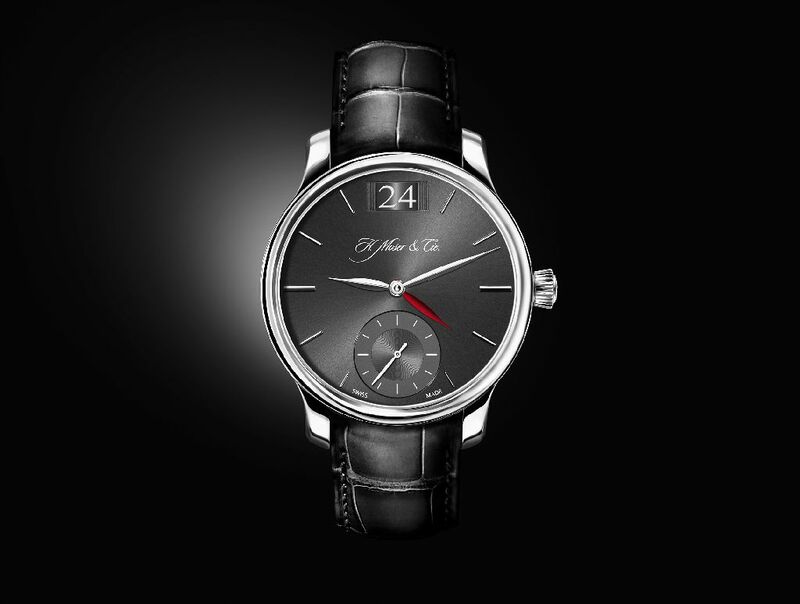 To indicate morning and afternoon, the Meridian – Dual Time uses a completely innovative system. A slide, moving back and forth, contains only the digits 1, 2 and 4. The correct display is achieved by either the digit 4 being hidden to the right of the window in the dial or the digit 1 being hidden under the dial to the left. The change of display at noon or at midnight takes only a second to complete. This has been accomplished by using a spring, which gains tension over a period of about eight hours without affecting the workings of the rest of the movement. Twice a day, the power of this spring is released at once to produce the rapid movement of the slide.